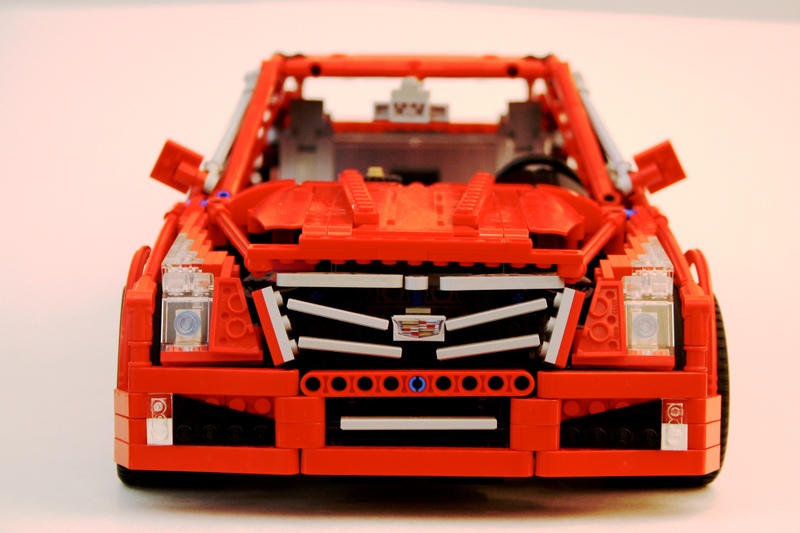 When I got out of college, I started getting back into LEGO; the end of my “dark ages.” I wanted to make a large supercar, just like everyone else. But after my first attempt, there were a couple of things I wanted to improve, and the first car did not really look right. OK, so what needed to change? I needed to stretch the car, and make the stance a little better, add some features, and make it as real as possible. I used the dementions of the 2005 BMW 5 series as my template. From these demensions I used the F1 Racer wheels and tires to set the scale, then I determined the wheelbase, got the width, and I went to work. I first made the rear suspension unit, and then the dual cam V-8. 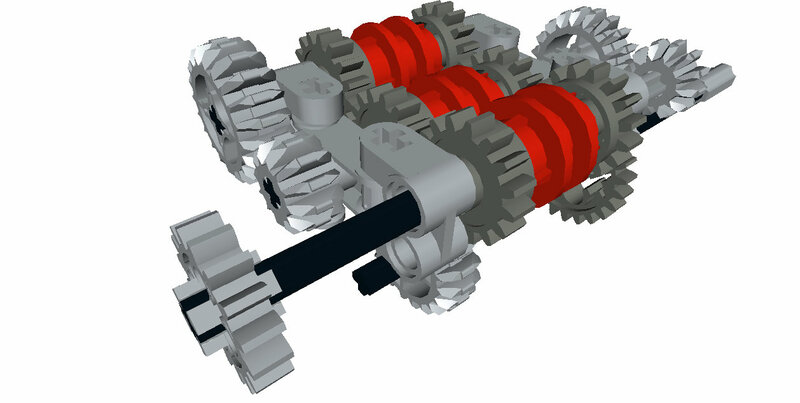 Then I linked the two with a 4 speed transmission, and a long driveshaft and added a simple parking brake. 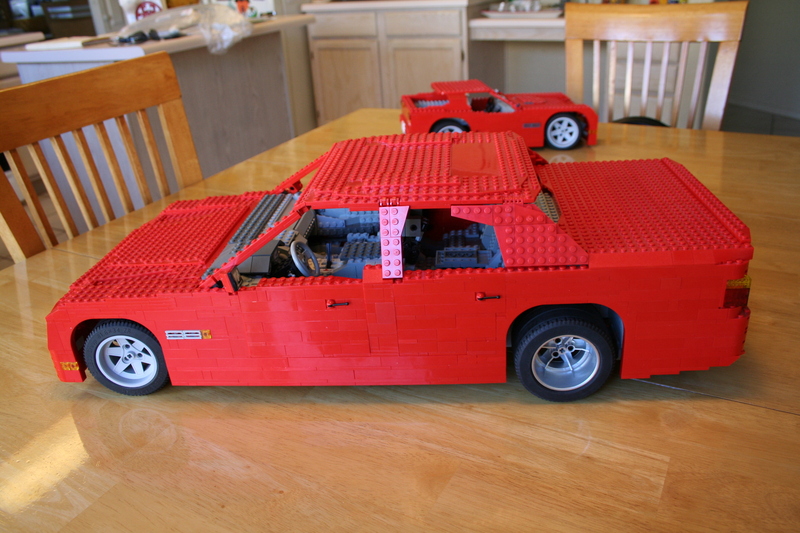 It took a little work, but I then added the front suspensions. 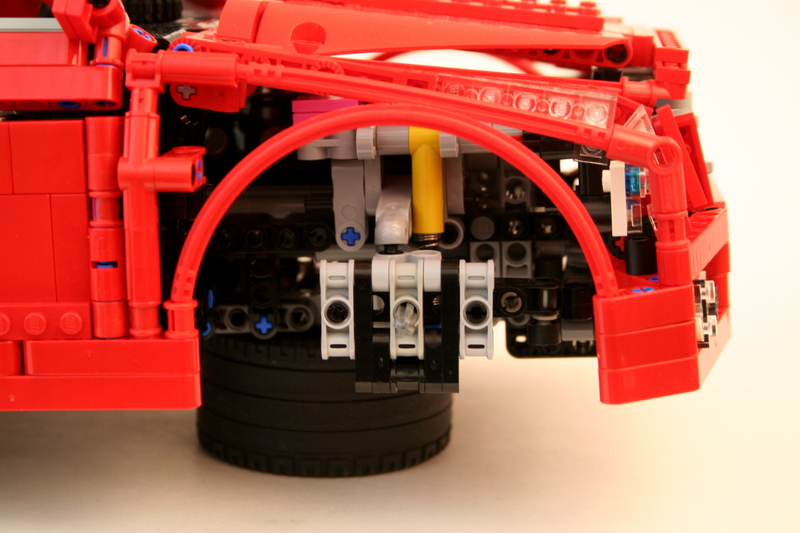 I have found it best to use technic beams to mount the front suspension. The A-arms are then attached to this structure, with the shock absorbers placed on this structure and braced with liftarms. I then connected this directly to the front of the V-8, and connected it to the rest of the chassis with a simple frame. 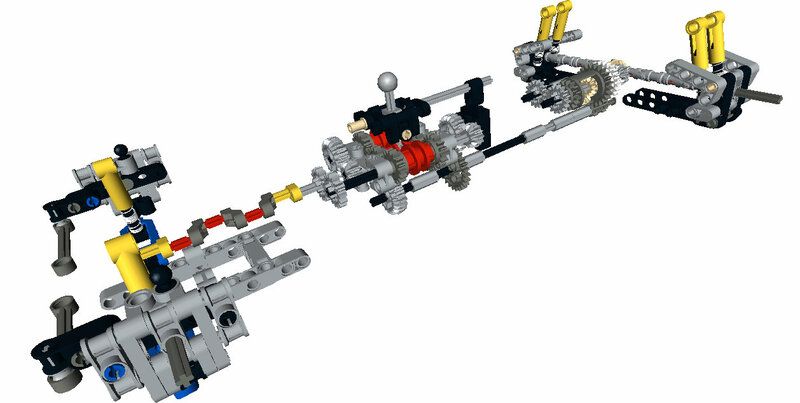 I used the old steering mounts of the old 8865 supercar, and connected them to the steering wheel through an upside down mounted steering rack. Of note, the car was going to be big and heavy. 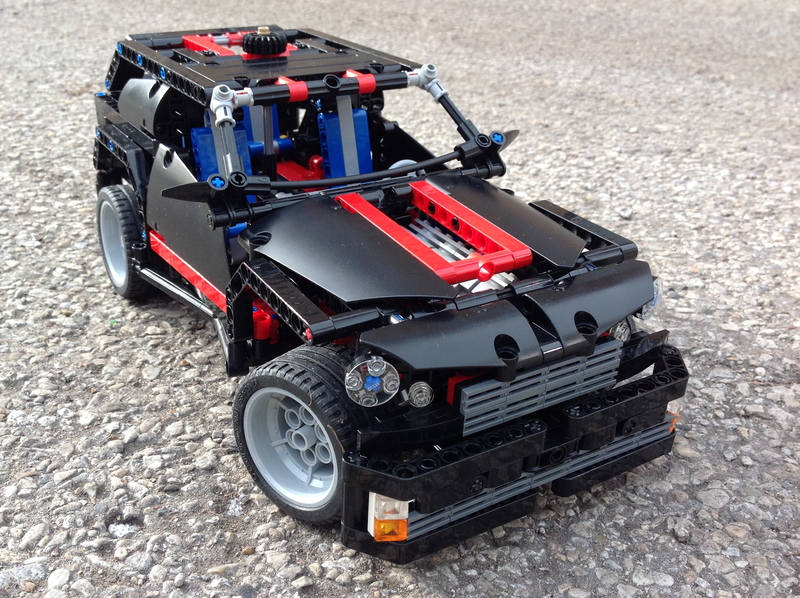 I had to find a way to get two hard shock absorbers at each wheel which limited the suspensions options I had. 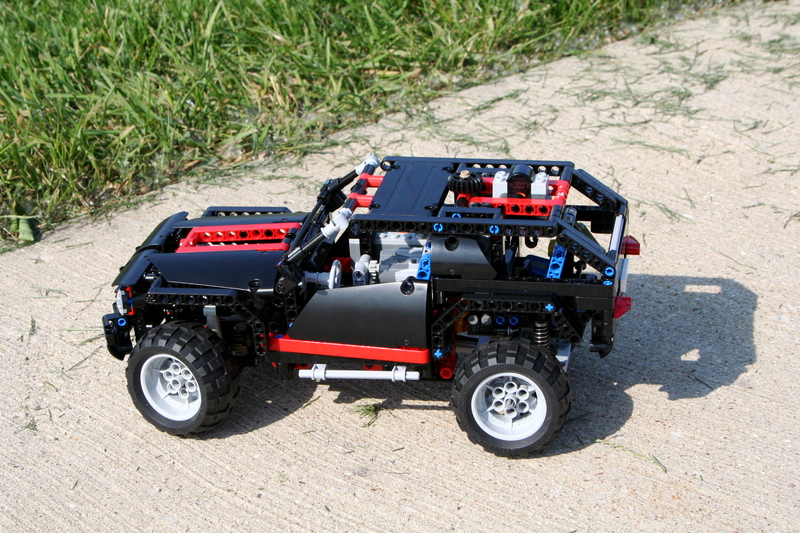 In addition, I added a front and rear sway bar, which took a little more space, but it worked. Then the body. I worked first on the doors, and the front bumper. I used a dual pivot design for the doors so they would open even though bricks do not work well with pivots. Then I did the front and rear quarterpanels, and set the rear bumper in such a way that a full size spare tire would fit. I then worked on the interior. I designed a simple tilt steering using a worm gear, and a universal joint. I made sure to use the great front seat design by Pixsrv, added a rear bench seat, funished the trunk and added all the little compartments in the center console and glovebox. I finished with rest of the body work. The roof had a sun roof, and the trunk would have a damped shock to hold open the trunklid, and added small details and some mirrors. It was big, and it was done. I was pleased with my first large car. It still my most popular on Brickshelf.com. All in all it was a great experience to learn about how to make a large car, and all the challenges that go with that. Frankly, since this design, most of my cars have been a little smaller, as it makes the suspension and steering work a little bigger. Lessons learned.